Intel’s 45nm Chips and a Wii Exercise Crazeâ€¦? The Nintendo Wii may not spark an exercise fad, but, in at least one well-publicized case, it may be leading to some welcome weight loss. 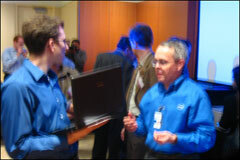 Also this week, we stopped by Intel, which was showing off its latest chip, Penryn. The 45 nanometer transistors on this microprocessor are being hailed as an engineering miracle (PodTech’s had a chance to get to see it in-depth, here. PodTech’s Robert Scoble also got some great footage here and here.). Intel scientists wouldn’t let us get too close to the actual microprocessor or take close photographs. IBM, which announced 45 nm technology today but still has their 45nm project in the development stages, would probably love to get a look at one, too.